Florence is my favorite Italian city. I have been twice, both times at Christmas. Everything is in walking distance. And despite it being a large city, it feels like a quaint town with lots to see. If you haven’t yet, you should visit beautiful Florence! This post is a compilation of both of my visits to Florence. The first time I went to Florence was with my family and fiance. My parents were moving abroad for work, and this was where we decided to meet for the holidays. We rented an Airbnb on the west bank of the Arno river, down the street from Ponte Santa Trinita. Even with being on the opposite side of the river from most of Florence’s main attractions, we were able to walk to everything pretty easily and it never took very long. Although my first stay was for a week, my second was for only a day. My fiance and I were in Italy looking at possible wedding venues and were flying out of Florence. After seeing all the venues we had lined up, we stayed two nights in Florence. We were both coming down with a cold by the end of our trip so we weren’t able to see as much as one normally could in that amount of time. But we still managed to see the Duomo, Ponte Vecchio, and do some some shopping. Here’s everything you absolutely need to see if you plan on visiting Florence. An absolute must see in Florence is the Duomo (Catterdale di Santa Maria del Fiore). You’d actually have a pretty hard time not seeing it because it is massive! It’s the fourth largest cathedral in the world. (It follows the Milan Cathedral, St. Paul’s in London and the Vatican’s St. Peter’s Basilica). Above is a photo of the front facade. You can purchase tickets outside of the Duomo or you can plan ahead and buy online. Make sure the Duomo is open the day you plan to visit. There is an all encompassing ticket on the website, too, which includes the Cathedral, the Dome, and the Tower. You’ll need to purchase a ticket to climb the steps to the top of the Dome. One the climb to the top, you’ll walk along the inside of the dome. It’s the only way to truly grasp the grand scale of the building. It’s also the best way to see how large the paintings truly are and the gruesomeness of some of the lower images (not pictured here). If you think you have time (and energy) to climb both the Dome (463 steps) and the Tower (414 steps), awesome! If not, decide what you’d like your view to be: the Dome or a higher view of the entire city. The climb to the top of the Dome is no joke, and we did it in the winter without a lot of people. Please keep this in mind before deciding to climb to the top. The steps are sometimes narrow and the ceilings are low in some places. It’ll be difficult to turn around once you get started if there’s a lot of people. If you make the climb, you will be greatly rewarded. Here’s the view from the top of the Duomo (the cupola) on a hazy winter day. If you’re planning to visit Florence as a day trip, this should be your first stop. Plan to spend one to two hours roaming around inside, outside, and at the top. If you can’t do the Dome climb, consider going to the Panoramic Terrace. 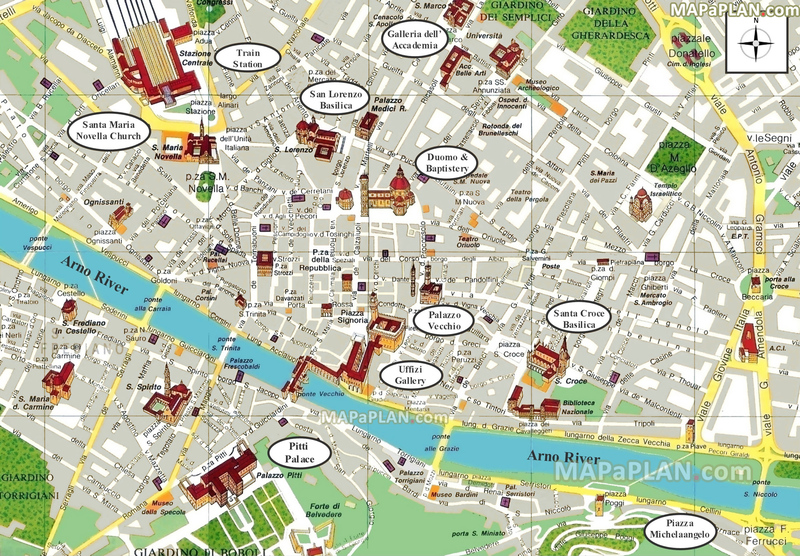 A map of the Duomo and where to find the entrances for the Dome and the Terrace is on the Duomo’s website. Check out the Duomo’s website because it has all of the information you’ll need. And remember, if you ever get lost, look for the Dome and you’ll find City Center. In front of the Duomo is a small building with a similar facade and famously ornate doors. This is the Baptistery of St. John. It is the oldest religious site in Florence. All Catholics in Florence were baptized here until the 19th century. Now its by reservation only. The bronze doors are the oldest and depicts scenes from St. John’s life. Above these doors are statues acting out the beheading of St. John (the originals are now inside the Museum). The original Northern Doors are inside the Museum Opera del Duomo, but the copies on the baptistery depict “Stories of the Life and Passion of Christ.” The eastern doors, facing the entrance of the Duomo, are known as the Gates of Paradise. In the 10 panels are scenes from the Old Testament. 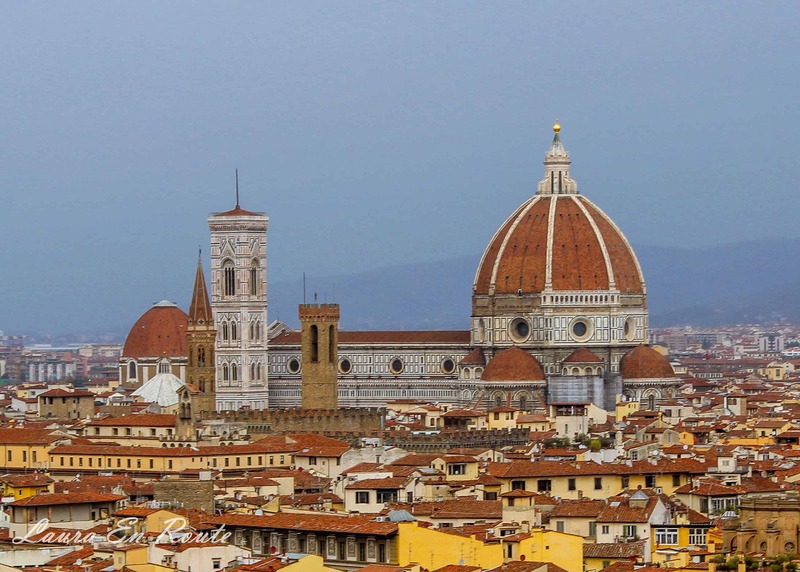 With 414 steps to reach the top, the bell tower offers panoramic views of Florence. Most notably, a view of the Duomo from above. There are no elevators and its not recommended for those who are not in shape, have heart conditions, or are claustrophobic (or of course fear of heights). But there are small terraces where climbers can catch their breath. Remember, when visiting churches in Italy, you’ll need to cover your shoulders, knees, and toes. (I had always been in the winter so this was never a problem, until I went to Milan in the summer and had to buy clothing so I could enter the cathedral.) There are also days when the Duomo, or other sights, are not open to the public. Another reason to check the website before you make your itinerary. Here’s a map (click the link to enlarge) you can look at while following along this blog, or while planning your trip. If you go west from the front of the Duomo, you’ll come across the main shopping street, Via de Vecchietti. This is where you’ll find all the fancy shops like Louis Vuitton (and others that I’m not fashionable enough to know about). But if you don’t see yourself buying some luxury goods, don’t despair because there’s also pastry and other yummy food stores. Back in front of the Duomo, you can follow Via Calimalla south to the next main attraction of Florence. Ponte Vecchio is the oldest bridge in Florence. Until 1218, it was the only bridge over the Arno river. It has miraculously only been rebuilt once, in 1345, after it was destroyed in a flood. It survived WWII because the Germans chose to block access rather than destroy the bridge. It was originally built as a defense, but as the shops were sold to merchants, the bridge took on an artistic flare. The bridge enclosure, above the shops, was added in 1565 when the Medici family moved into the Pitti Palace (see below) and wanted to cross the bridge without mingling with the common folk. The Vasari Corridor connects the Uffizi Gallery to the palace and now hosts a museum. You can enter the corridor through the Uffizi Gallery. Along the corridor you’ll be able to look small windows over the Arno river and eventually through a grated window overlooking the Church of Santa Felicita where the Medici family held mass. The corridor is the structure that was destoyed by the Nazis during WWII. Also, there are pieces of art that pieced back together after they were badly damaged from a mafia-led attack in the early 1990’s. If you want a view of the famous bridge, head down to Ponte Santa Trinita, pictured below. You can then walk along the river and walk across Ponte Vecchio. There are several stores selling jewelry lining the bridge. Stores have been present on the bridge since it was originally built in the 1300’s, but back then it included everything from butchers to tanners. To improve health and welfare of the people crossing the bridge, it was ordered in 1593 that only jewelers and goldsmiths could open shop along the Ponte Vecchio. There is also a bust in the middle of the bridge of a 16th century goldsmith and sculptor, Benvenuto Cellini (who seemed to have a dramatic life). On the Eastern side of the Ponte Vecchio, and on the north bank, is where the museum is located. The Uffizi is a world-famous art gallery. You could spend all day here (although you’re limited to 4 hours) so plan your time wisely if you decide you want to visit (especially if you’re only in Florence for a day). The building is a large U-shaped gallery. It stores the largest collection of Italian Renaissance artwork thanks to the Medici family who donated their collection on condition that the pieces never leave Florence. Here’s one of the main hallways (corridors) inside the Uffizi with rooms, such as the Tribune Hall, branching off to the right. If you get peckish, there is a cafe you can stop at for a bite to eat or for espresso. There is patio seating with a view of the Dome, but it’s part of a restaurant so don”t just go sitting down in the chairs. They don’t like it. There are plenty of unofficial websites that sell tickets for the Uffizi. Many are reliable (like uffizi.com) but charge extra for their service. The official Uffizi website is here. It’s not as fancy or easy to use, but if you’re not sure about using a middleman, purchase your tickets directly from the museum. I highly recommend buying tickets online a few days in advance to avoid the long lines you’ll likely encounter. Located on the southern bank, and across Ponte Vecchio, is the Pitti Palace and Boboli Gardens. The Pitti Palace consists of an Art Gallery and Royal Apartments. It was built in the 1400’s by Luca Pitti. He wanted to rival the Medici family in elegance. His plan backfired when his elaborate desire led to his family’s financial ruin. The wife of Cosimo I de’ Medici purchased the unfinished palace in 1550. This move led to the Palace becoming the main residence for the Medici family. Even after the end of the Medici family’s reign, the palace remained a private residence for Dukes and Duchesses. My fiance and I purchased tickets (for the gardens) outside of the Palace on Christmas Eve, so there wasn’t a line. I imagine this won’t be the case on other days. Since we didn’t have time to explore the Palace, we decided to just stroll around the gardens behind the palace. The gardens were started by Lazo Pitti, but became the masterpiece it is today under the Medici family. The gardens spans up the hill to the Medici’s fortress, Forte Belvedere. Remnants of the ancient defensive walls can still be seen today. If you walk straight out from the center of the Palace, you’ll pass through the Amphitheater. Continuing up the hill, you’ll reach the Neptune Fountain, below. At the top of the hill is the Statue of Abundance. 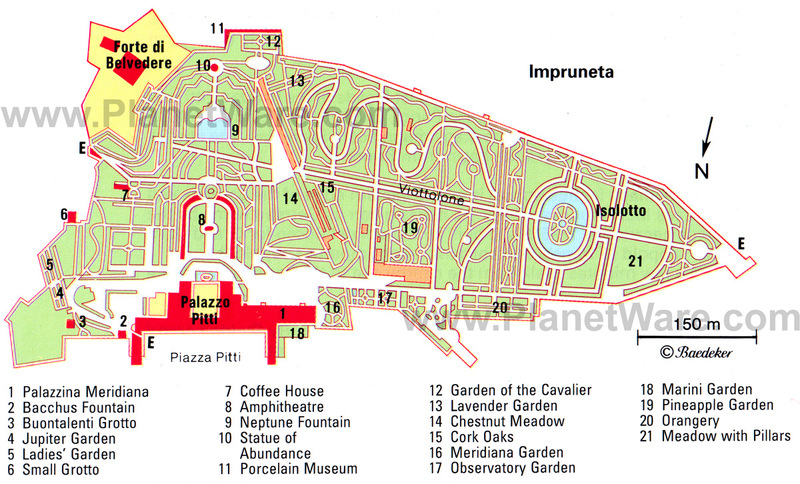 For a map of the gardens, click here. Even though it was winter, the gardens were still beautiful and offered great views of the city. This neighborhood, “beyond the Arno”, is where the Pitti Palace is located. There are several artisan shops in this area. Leather stores are everywhere in Italy, but Florence is known for its handmade papers. I have purchased Christmas gifts from Il Papiro, one of the more well-known paper stores. (1) Le Volpi e l’Ulva – This is a wine bar. It is a tiny wine shop with meats and cheeses. The employees were very nice to us and extremely helpful. Maybe it was because we were buying several bottles of wine to bring back to Texas, or they were just that friendly. I like to think the latter. (2) Trattoria Bordino – This is a restaurant where my family ate without me when we went to Florence for Christmas a few years ago. I got sick our first night there and missed out on dinner at this restaurant. But when my fiance and I were in Florence in 2016, he brought me back to this uniquely decorated trattoria. (3) Pizzeria Toto atto Il – If you’re in this area and want a quick bite to eat, stop in at this pizza place. (Don’t walk all the way from the Duomo just to eat here..that’d be silly) We actually ate here twice, first in 2013 and this last time we were in Florence. If you order off the menu, expect a large portion of pizza! Also, somewhere near this restaurant is a street with umbrellas hanging above the road. (4) Piazza Santo Spirito – a square located off of Via del Presto di St Martino (which turns into Borog Tegolaio). If you’re staying on this side of Florence, this square has a few restaurants, a market on some mornings, and a church (I never went inside). We sat outside of Volume for a cafe and crepes! Everyone thinks about gelato when visiting Italy, but do not pass up ordering a crepe. It’s amazing to watch them being made and taste amazing. Note: restaurants in Italy close after lunch and don’t open until 7 PM. But even 7 o’clock is early for most Italians to eat out. The earlier you eat, the less wait time you’re likely to encounter. Now, enough of that side of Ponte Vecchio (we’ll back in a bit). Did you know you can see Michelangelo’s Statue of David while in Florence….three times? The first, and the original, is housed in the Accademia Gallery (located near the train station and San Lorenzo Basilica). There are also two copies around Florence. When visiting the original, you’ll want to reserve your tickets ahead of time. It’s a popular exhibit and a lot of art students will be camped out attempting to draw the masterpiece. I believe you are not allowed to take photos (though I think that’s become difficult as people will still use their phones and pretend they aren’t taking pictures). So if you want to capture a picture of the statue, you can head to one of the locations of the copies. The second is located in Piazza della Signoria which is just outside of the Palazza Vecchio (there is a nice courtyard on the inside). This piazza has been a center for politics in Florence since the 14th century. Aside from the David duplicate, there are a lot of other statues in the Loggia dei Lanz, an open-air gallery. Some of the statues are a little bizarre. The bronze statue of a man holding a severed head is Perseus. It was scuplted by Benvenuto Cellini (his bust is found on the Ponte Vecchio). Also located in the piazza is the Nettuno statue and fountain, dedicated to the Medici family’s maritime ambitions. The third is located in Piazzale Michelangelo (in bronze). This is located on the other side of of the Arno river, and can be reached by a long walk uphill or by car. Not only will you see a copy of the David, but you’ll get almost panoramic views of Florence (the cover photo for this post was taken here). What is interesting about this location is that the statue is practically in the middle of a parking lot. There were a lot of tour buses, too. So if you plan on driving be prepared to look for parking. It took patience to get a photo without people in front of the statue, and this was in the winter on a rainy day. We followed Google Maps on our phones and walked to the top of the hill. Speaking of parking. Here’s a site with helpful information on driving into and around Florence (for anyone taking a road trip through Italy). Remember to look up the ZTLs ahead of time so you can avoid them. The Santa Croce Basilica was built in 1295 where an oratory for Franciscan friars originally stood. The front facade was designed later in 1863. It is the largest Franciscan church in the world. During December, there is a Christmas Market in Piazza Santa Croce, just outside of the Santa Croce. The basilica is where Michelangelo, Galileo Galilei, Rossini, and Machiavelli are buried. Many famous artists also contributed to the monuments and chapels within the church, including Donatello, Michelozzo, and Leonardo Bruni. Along with the monuments and tombstones on the floor, the church is known for its frescoes. Outside of the church is the cloister and chapel. To find out more about the church and buying tickets, click here. If you plan on staying in Florence for a few days, I encourage you to roam the city and find other treasures Florence has to offer! Or better yet, go during the Holiday season. My favorite things about Florence at Christmas are the streets are decorated with lights, there’s a huge Christmas Tree in front of the Duomo, and the weather is really nice for climbing the Duomo and just walking around the entire city. The first night we were in Florence with my family, we were walking around trying to stay awake and stumbled upon a parade heading towards the Duomo. In the main shopping district, there is a beautiful carousel. I’m not sure if its there year round, but its been both times I was in Florence during December. On my first visit, my sister and I rode the carousel. To find out more about what there is to do during the holiday season, click here. Have you been to Florence? What are your favorite sights? What’s your favorite time of year to see this beautiful city?